COOKIES, PIES, CAKES, BREAD, MUFFINS, BROWNIES, MACAROONS...! At Freund’s Farm Market, visitors are often greeted with the rich smell of freshly baked pies, breads, and cookies from the upstairs kitchen drifting into our market. Whether you crave a pie, cake, muffins or brownies, or just want to impress some visitors with a specialty dessert for your next gathering, you can count on a wide variety of seasonal goodness at Freund’s Farm Market. Stop by today to see what treats we have for you. Want a customized cake for a special celebration, scroll down to read more all about CAKES! Theresa Freund shows off the flavors of the day with her freshly baked pies. So popular, they deserve their own section. We freshly bake pies throughout the week and always have a variety of flavors to choose from on display. We gladly accept orders for one or a dozen if you're hosting an event. Special Requests for Mincemeat, Boston Creme, Banana Creme or other flavors can be accommodated if ordered ahead. Thinking about your next fundraiser? Check out this spreadsheet we used for previous holiday 'pie' orders for local schools. Our bakery can prep frozen pies, frozen cookie dough and savory dishes for your next fundraiser. In a rush and don’t have time to cook tonight? Forget TV Dinners! Stop by to pick up one of our quiches or chicken pot pies. You can also call ahead and we can put together almost any type of meal you need, from turkey dinners for the holidays to baked hams for Easter. Visit our catering page for some menu ideas. If you're ready to place an order, call today at 860-824-0650! 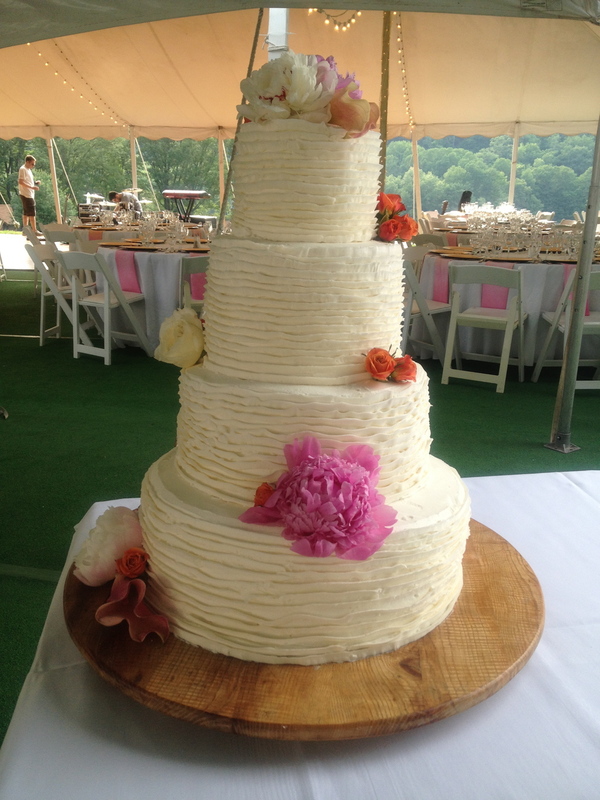 Theresa baked and decorated her own wedding cake for their backyard wedding and that was just the beginning. Theresa makes cakes for all occasions; baby showers, birthdays, anniversaries, weddings and any other reason you have to celebrate. Download our wedding cake flyer to learn more about flavors and styles and call to discuss your upcoming event.